A vital component of our mission is helping our members ‘EXCEL ACADEMICALLY’. 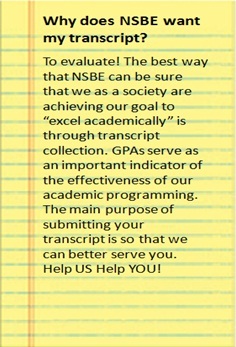 The NSBE GPA Initiative is an effort aimed at increasing the number of students (NSBE Jr. through graduate students) who submit their transcripts to NSBE World Headquarters (WHQ) each semester. Transcripts are used as a metric for establishing the academic state of our society including both where we are thriving as well as where we could use improvement and resources. Transcript data collection is priceless as it allows us to obtain quantitative data that can be used to measure the effectiveness of programs such as The Retention program, Achiever’s+, and SEEK. With this data we can make changes and advancements where necessary and learn how to provide additional support to YOU, our membership. 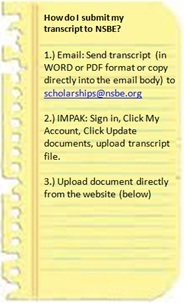 Why should you submit your transcripts? Check out the benefits below! Helping NSBE to fulfill our Mission – Be a part of something bigger than yourself!